For a guy who doesn’t much like television these days, I have to confess, I’m going to miss this show. For 11 seasons, this quasi-reality series on A&E kept me and my wife smiling. Focusing on the Robertson clan out of Louisiana, led by patriarch Phil (inventor of the modern duck call), this show, with its humor, values, and well-meaning misadventures was a true breath of fresh air amongst all the other garbage stinking up the airwaves. It dared to be simple. It dared to wear faith and family proudly. Really, in very simple ways, it dared to be different. 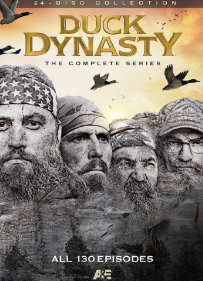 Most of the 11 seasons focused on the Duck Commander business, led by Phil’s son Willie (all but one of the Robertson men bear big bushy beards) as CEO, and his efforts to get his brothers Jase and Jep, his grizzled Uncle Si, and a couple of other employees motivated to keep assembling their famous product by hand. But the show gave us glimpses of all in the family, and shared with us their triumphs and troubles. Who could ever forget the weddings, the vacations, the adventures in the woods (battling beavers and collecting frogs among my favorite moments)? It was a family being a family, and the show never failed to end with them bowing their heads in prayer at the end. Willie and crew always reminded us what family was all about, and that the real riches are in those who love you, even if they never cease to get on your last nerves. From the first episode, where Willie’s brothers decide to flood their warehouse’s loading dock to get real ducks to test their stuff on (it exasperates Willie, until he realizes he wants to see if it works) to the finale, where good old Uncle Si finally retires and rides off into the sunset (in the most perfect way imaginable), the show was a surprise hit. Well…surprising only to those who couldn’t understand why a show so rooted in family and values would be a hit with mainstream America. It became one of A&E’s biggest successes ever, but didn’t make it through all of its years without controversy. When Phil unapologetically quoted the Bible to the offense of snowflakes everywhere, the show was briefly in doubt. The network wanted Phil removed. The family was willing to walk away from the show rather than abandon him. The family won, although possibly in just a small way, as Phil’s ever-dry presence seemed less and less as the seasons wore on. By season 11, he was almost a non-entity, save for his appearance at Si’s retirement. The spirit of love and faith prevailed with charm and humor, and it was that spirit that kept us all coming back season after season. It was a safe place from the chaos of the world…no matter how the walls were falling down around us, there were still squirrels to stew, blinds to be built, dams to destroy, and brothers trying to outdo one another in friendly rivalry, but never failing to come together to pray at the dinner table. It really was the kind of show we didn’t see enough of on television…I already miss it. I wish this Walmart exclusive set had been available on Blu-ray, because it looked great in high definition on air. I can tell the difference in many of the outdoor scenes, which aren’t quite as crisp, but these DVD discs still deliver good coloring and anamorphic widescreen presentations. The simple stereo track is serviceable enough; the show is mostly dialogue-driven, so not a lot of call for surrounds or dynamic range. Spoken words come through clean and clear, even if Si has to be subtitled from time to time. Duck Dynasty was a dynasty indeed…a simple show about simple (but wealthy) people who valued family and faith over money and materials. They were funny, warm, and relatable from start to finish and went out on a high note. Don’t despair…with this new complete set, you can still have dinner with the Robertsons any time you want. And save me some of Miss Kay’s pie while you’re there.